1) Is it large and/or heavy? 2) Have multiple people recommended this item for your destination? 3) If it gets lost or stolen will you be devastated? Is it replaceable? 4) If needed, could you buy it out there? Saying goodbye to our friends and family before boarding a one way flight was traumatic enough, we weren’t also going to leave behind sentimental gifts, and bringing a few well chosen bits and pieces have been really comforting. There is however the worry of them going astray. 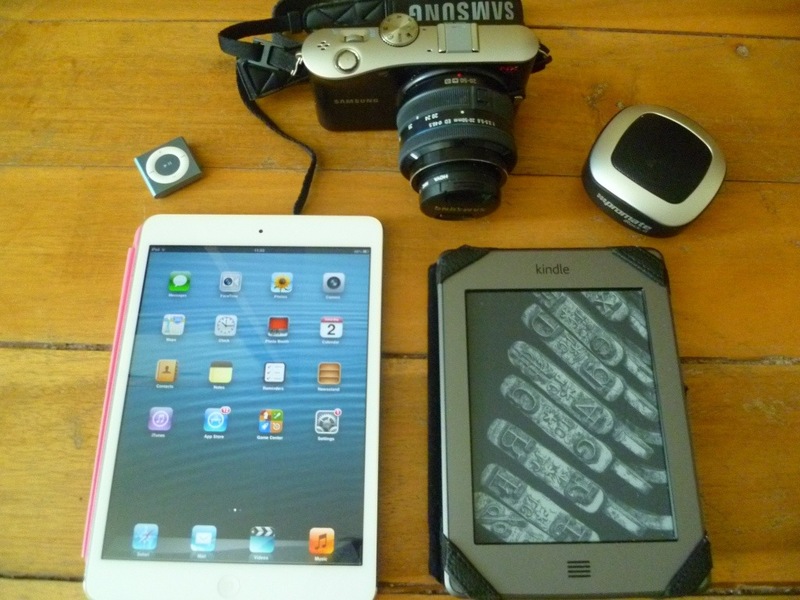 Whenever we haven’t felt comfortable leaving valuables at our accommodation, we’ve taken them with us. It’s annoying, but ultimately brings peace of mind (and luckily a lot of the time you can rely on lockers). 1. 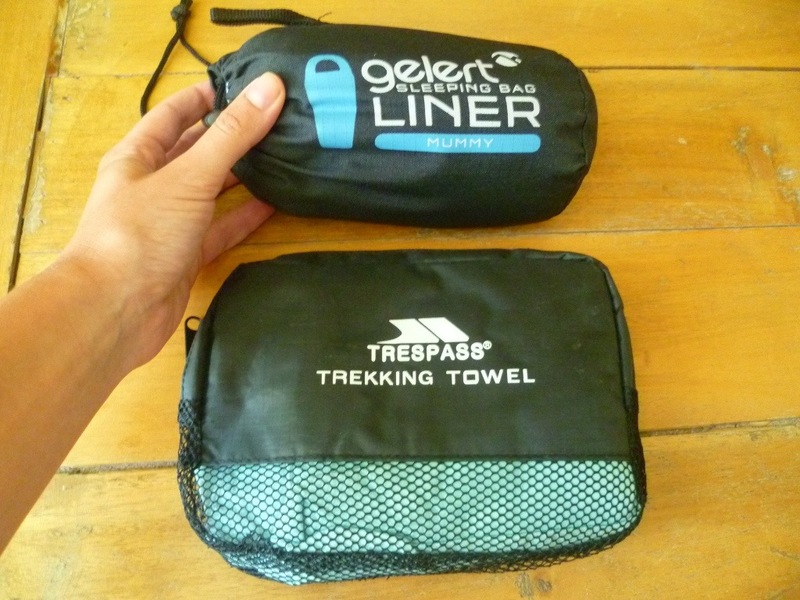 Trekking towel: Similar to a travel towel it folds up really small, but a trekking towel also dries extremely fast, and is much lighter to carry. It’s impregnated with an anti-bacterial to keep it fresh and prevent it from going mouldy, so you can even pack it away when it’s still wet – great if you’re squeezing in a shower before check-out. 2. Double mosquito net: We’ve found that every beach hut or hotel that’s required the use of a mosiquito net has had a double bed. Go for one with sticky pads to attach to walls as there are rarely hooks in place for you to use, or opt for the pricey (but totally worth it) pop-up mosquito net. 3. Sleeping bag liner: a single duvet cover or sleeping bag liner is really useful when bedding isn’t provided or is of questionable cleanliness. A sleeping bag liner is the lighter choice and folds up much smaller; a cotton one will keep you cool and if you opt for the mummy shape, there’s fabric to cover your pillow with too. 4. First aid kit: Having heard stories of horrific accidents from friends, we invested in quite an extensive medical kit, complete with bandages and our own syringes. Such a large kit isn’t vital for the islands, as the hospitals are excellent here, but the endless supply of plasters, painkillers and anti-sickness tablets provided have been like gold. The tweezers are also very handy for splinters (and eyebrows). 5. Waist wallet: There are warnings everywhere on the islands about pick pockets and bag thieves. Although we didn’t experience any trouble, we came across people who had. When everyone is wearing these, thieves have cottoned onto it, but having our passports and money hidden under our clothing meant they were always close by, accessible and far safer than if stored in a bag. 6. Combination padlock: We emphatically advise you to opt for a combination lock as opposed to one with a key. The number of hungover backpackers unsuccessfully trying to break into their own lockers was hilarious to witness. We also used the padlocks for securing our rucksacks when leaving them in hostels or when being forced to abandon them in luggage rooms on boats. 7. Head torch: Parts of the Thai islands are completely engulfed in darkness come nightfall. Street lighting is sparse and our trusty head torches helped us navigate the uneven roads and sleeping stray dogs. 8. Waterproofing: Those long tail boats may look ever so elegant but they’re mightily choppy! At times there were waves smashing down over our heads whilst we had our electricals wrapped in a life jacket as we cowered over them on the floor of the boat. We swiftly invested in some waterproof pouches. We weren’t on the islands during the rainy season but even so, we experienced a taste of the Thai downpours. Within 20 seconds we were soaked through, whilst thanks to the raincovers our rucksacks remained completely dry. 9. A decent jumper: It’s so cold when the air-con is blasting a full-on gale; the air-con on transportation seems to be particularly aggressive. We’ve frequently rushed from trains or buses to warm up outside! Brrrr! 10. Luxury electrical items: Not necessary, but these make life so much easier and more comfortable! As bloggers we have found a tablet vital (internet cafes charge per minute, and can get expensive, but free wifi is everywhere), but it can also be used for keeping in touch for free, and it’s so much lighter than a laptop. Whilst it’s trickier to blog from than a laptop (more on that later), it’s perfectly sized for small lockers and our daybags. A Kindle (we recommend the Paperwhite 3G) and an iPod are lifesavers on those long bus rides… and a small speaker is great for making friends in a hostel, or getting ready for that night’s beach party! The islands are so much fun whilst being breathtakingly beautiful, so it was hard not to take photos constantly. We have a small point-and-shoot to withstand the sand and splashes, and a compact system camera to capture the truly postcard moments. What you bring is entirely up to you and some people are out here with just the clothes on their back. We were just relieved to have kept things as small and light as possible, helped by us dividing some essentials between us. Island hopping should be quick and easy, not spent dragging an overweight suitcase through wet sand (we surprisingly saw this a lot!). Do you think we’ve missed something worth noting? What would be on your packing list? 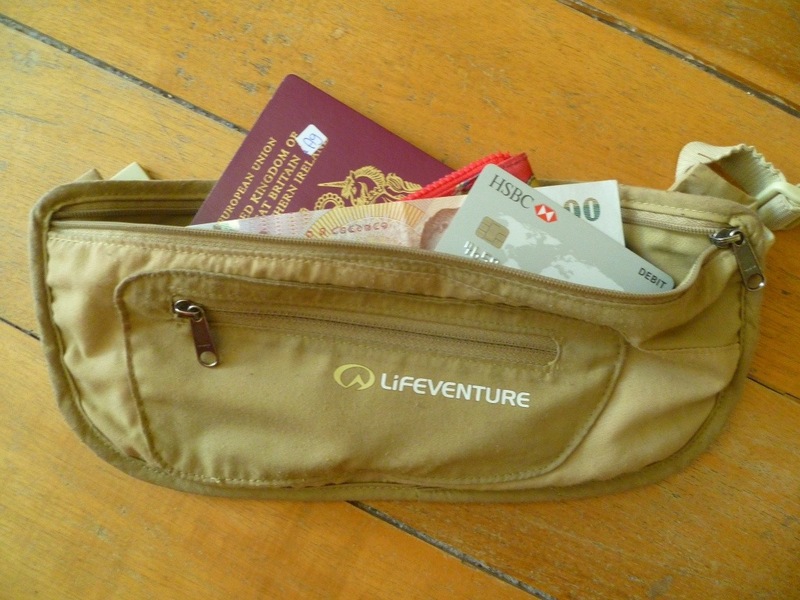 This entry was posted in Thailand, Top 10 and tagged blog, first aid kit, islands, list, mosquito net, packing, rucksack, thailand, towel, travel, two one way flights, waist, wallet by Two One-Way Flights. Bookmark the permalink. Nice to meet you, ladies! It will be a pleasure for me to reed your blog 🙂 Have a great trip there! I completely agree with everything you suggested!! A mosquito net, sleeping bag liner, travel towel, money belt, first aid kit… Yep – absolutely essentials for backpacking in Asia. Great post!! Thanks, I don’t know how anyone survives South East Asia without them! Great blog by the way, absolutely LOVE your post on a little bit of trust, so true!! This is a very nice blog indeed! Hi, thanks for the follow. Hope to keep in touch. Very nice items. The mosquito net, the first aid kit and the headlamp or torch is a very good call. I don’t know how many times I’ve been somewhere and there was a hole or holes in the net or it was dirty… The first aid kit is generally a must so that the little cuts and bruises can be catered for as and when rather than waiting to get to the next bigger town. The torch was enormously valuable when I went to Vietnam and because I was unwell, the rest of my “group” went onto dinner. One of the guys offered to stay with me and when I was finally able to go, we had to walk through this very dark forest (nobody told me about that) LOL. Thank goodness he was with me. He also used to be in the army so had a torch on him. Good thing too as I saw some things on the ground that I really wanted to know were there!